Shifting Demand: Thermal Imaging… Don't They Have An App For That? 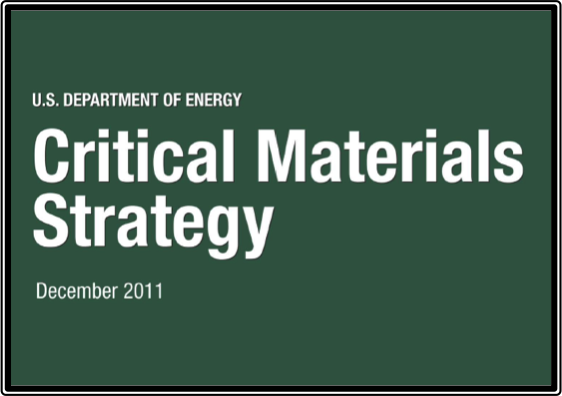 During 2011, germanium prices flat-lined as demand from the IR sector dropped, coinciding with the withdrawal of troops from Afghanistan and Iraq. 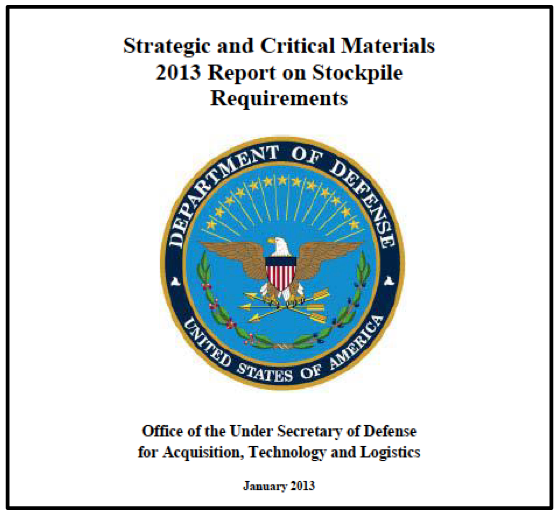 But by April of 2012, despite stagnating demand from IR system manufacturers, germanium prices started moving higher, signaling the end of the linkage between military spending and germanium prices. 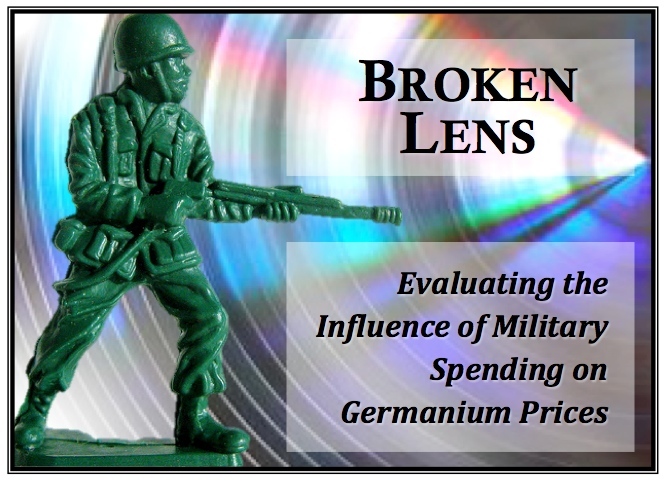 If germanium prices are no longer guided by military demand for optical lenses, what has led prices higher since early 2012? 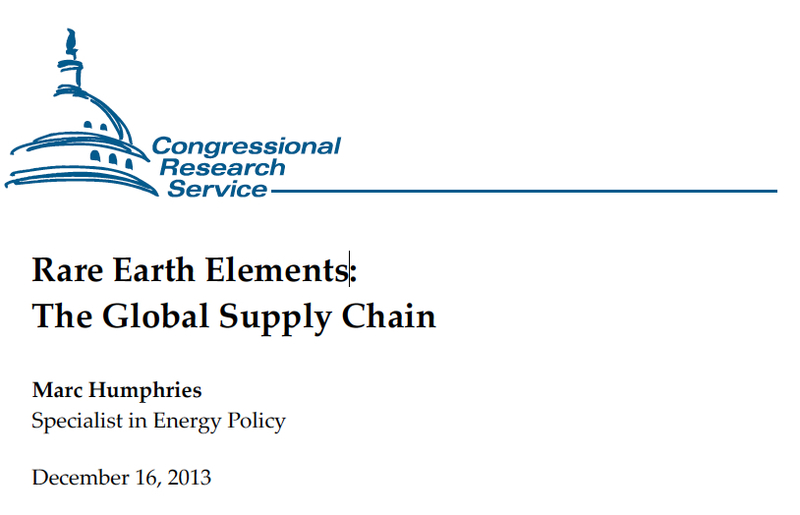 Simply put, the electronics sector has supplanted much germanium demand. 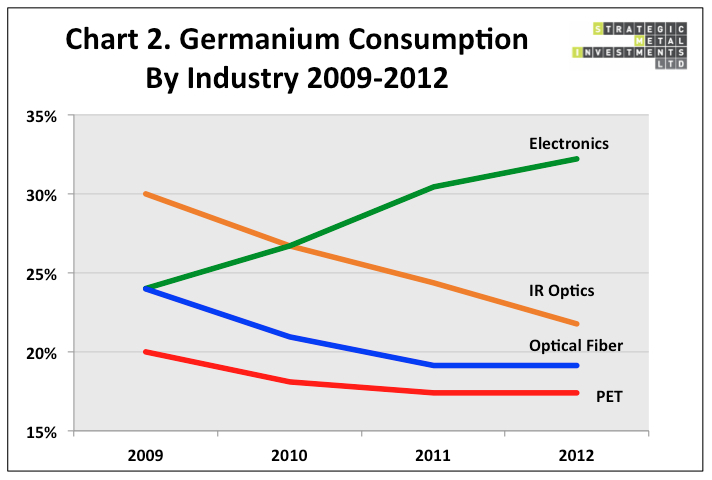 Looking at the four major germanium consuming industries, all have seen changes over the past five years. The largest drop in consumption has been in the IR optics sector, while the largest increase in demand has come from the electronics sector. Semiconductor and solar cell manufacturers have learned to increase energy efficiency by depositing germanium and silicon gases on multiple junction devices. And it is growing consumption from this sector, in particular, that has driven demand since 2009. Chart 2 shows the general trend in consumption patterns by different industries between 2009 and 2012. 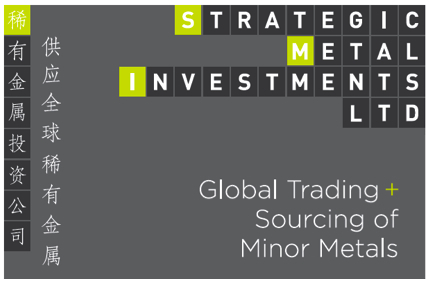 While precise statistics on consumption do not exist, evidence of this shift away from IR optics towards electronics was provided last year by pricing in the spot markets for germanium dioxide and germanium metal. Germanium dioxide is a precursor to germanium metal, which converts to the metal at a ratio of about 1 to 0.7. 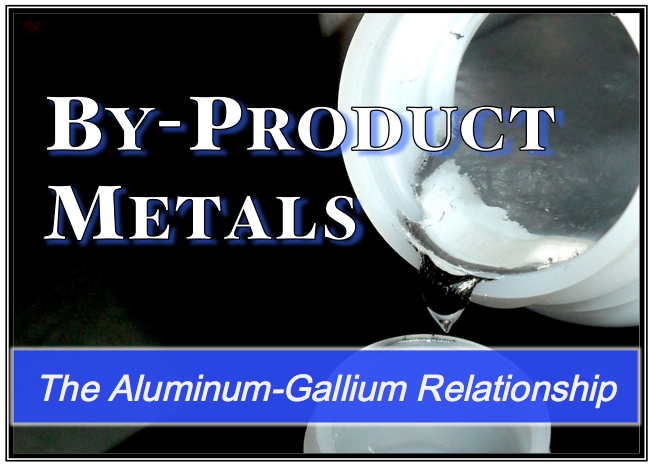 For this reason, the metal normally sells for roughly 50 percent more than the oxide form, a premium being charged after conversion rates are accounted for. 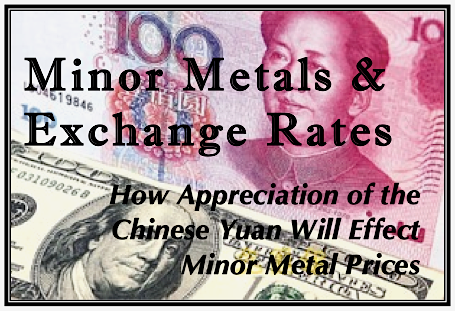 Yet, between the second half of 2012 and early 2013, due to strong germanium dioxide sales and anemic demand for the metal, the price difference in the spot market for the two had decreased from 50 to 35 percent. In effect, there was no conversion premium being charged for the metal. 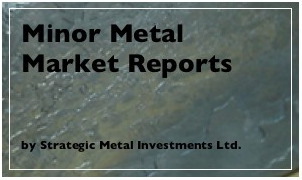 With the current market situation not looking to change any time soon manufacturers are now beginning to adjust, lessening the rate at which germanium dioxide is converted to metal. 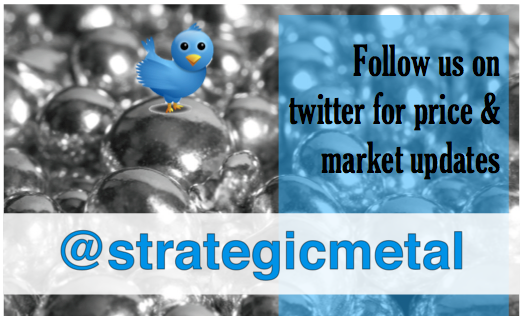 But what does this all mean for germanium prices going forward? 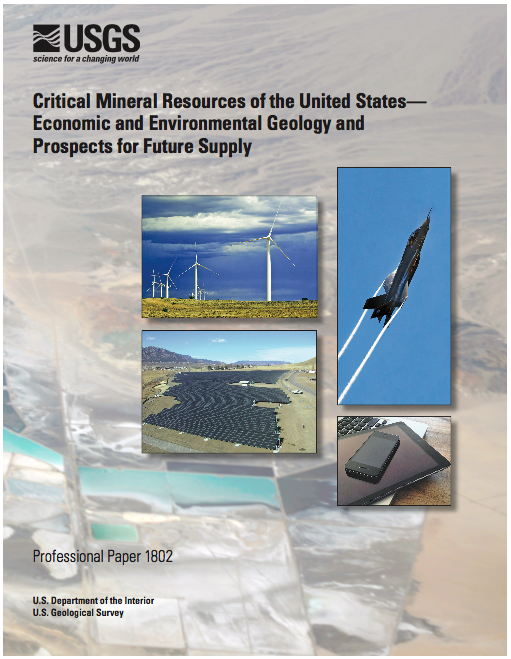 The reality is that, overall, the market for germanium is still relatively weak. Despite the boon provided by demand from electronics industry, most other sectors have seen demand shrink over the past few years. Excess output has been procured by China's State Reserve Bureau in recent years, which has strengthened prices, but real consumption from a key sectors, including IR optics, the PET catalyst industry and fiber optics, has either decreased or seen little growth. Demand for concentrated photovoltaic cells (CPVs), which were once expected to drive demand for the metal, has grown at a much slower pace than many expected and still only makes up a small fraction of total germanium consumption. 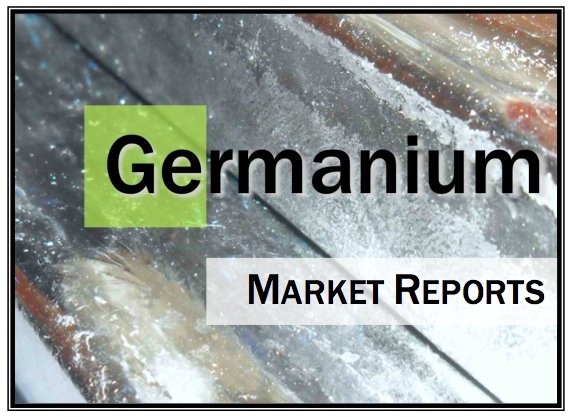 As those in the market understand, the limited size of the global germanium market, combined with its concentrated supply, allows the actions of certain players to have a direct and immediate impact on prices. And, without question, some of the current price strength can be attributed to this factor. 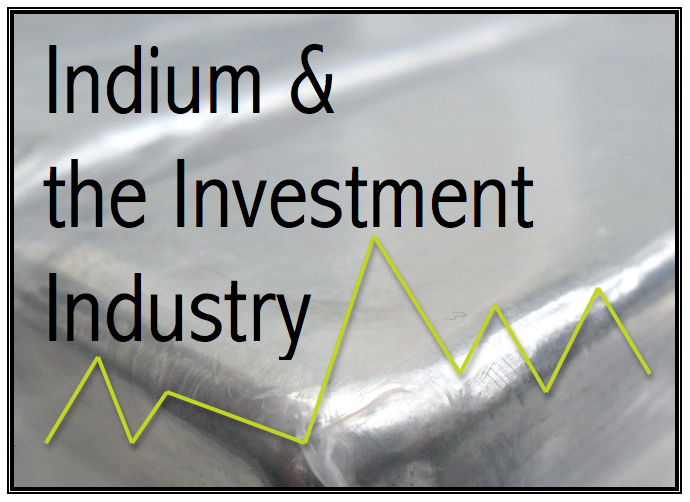 Meanwhile, a lack of transparency, inherent in many minor metal markets, has contributed to distrust between germanium consumers and producers. This has factored in the ongoing confusion over prices. The reality, however, is that for the first time in a decade, it is demand for germanium dioxide that is now driving the germanium market. 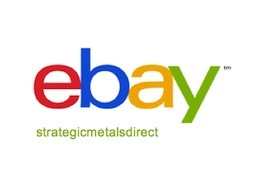 Consumers from all sectors are going to have to acknowledge these changes and may have to make more of an effort to understand the importance of the electronics market on demand and pricing for germanium. 2. 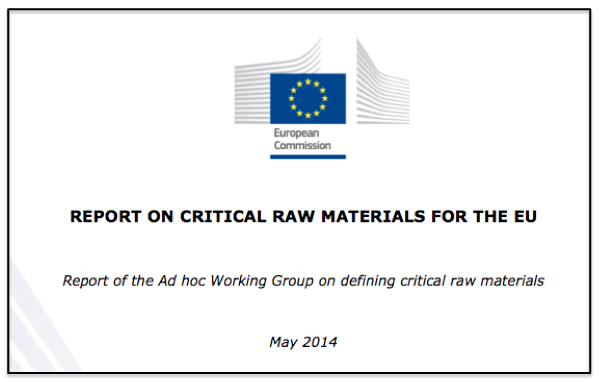 The quantity of GeO2 outlined in this agreement was later significantly reduced.